My Mexican guide, Alfredo, lowered the binoculars, slowly turned his head, and spoke again with the steady assurance of an old hand. Alfredo, one of Enrique’s guides, poses with a thirty-seven-inch typical buck. Three hours earlier, as we conferred over a smoky pre-dawn mesquite blaze and a cup of scalding cowboy coffee, this same Mexican guide had repeatedly emphasized the virtues of patience and luck. "Paciencia y suerte," he had said, "patience and luck." "The burros are here. We just have to find them. Don't be impatient. With just a little luck ..."
He had met my measuring gaze over the rim of his weather-beaten blue-enamel coffee cup and smiled knowingly, his bleary, bloodshot eyes flickering the reflection of the fogata's flame. Now, just hours into our six-day hunt near Hermosillo, Sonora, as the red-orange sun slowly warmed the Mexican-desert floor, his early admonition drifted away like the earliest morning chill. He wanted me to shoot, and the look in his eye and tone of his voice left little doubt as to his conviction. Sonora, Mexico, is hallowed ground for dyed-in-the-wool mule-deer hunters. Forty-inch giants walk the earth here, and every season, a few lucky hunters take home mule-deer monsters that defy description. 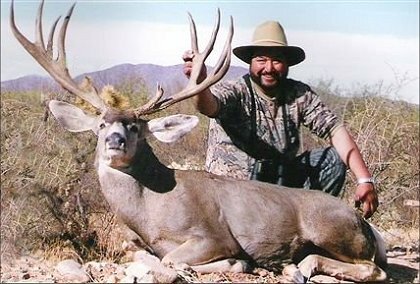 A photograph of Alfredo with a tremendous thirty-seven-inch buck taken on another ranch the week before we hit town had arrived via email just before I had left, and it cemented my faith in both the particular area selected by Tucson-based outfitter Enrique Ramírez, of Enrique's Trophy Hunts, and Alfredo's savvy at putting tags on these out-sized Mexican muleys. Now it seemed that Lady Luck had for once shown her hand too soon. She had trumped my cards seemingly at every turn in my twenty-five-year quest for a truly large mule deer. But now, despite Alfredo's early restrained optimism, in the patch-work of mesquite, saguaro, and palo verde laid out at the foot of the little knoll we had climbed in the Sonora-desert dawn stood the three largest bucks that I had ever seen. Three genuine muy grandes, thirty-inch-plus bucks, the smallest of which, right at the edge of my rifle's range, stood broadside in the shade of a smallish ironwood tree, looking straight at us. I had no business hunting in Sonora. At least, that is what I thought a year before as I hung up the phone with Enrique. "I found what I think is a great ranch," Enrique had said. "Nobody has hunted it for years, but the place is not ready to house a formal hunting party. The ranch house itself is very good, but there is no electricity or hot running water, and no time to set it up. It's going to have to be a drop-camp affair." A drop camp in Mexico? Unhunted for years? Both notions were exciting, yet they troubled me. Still, my intrigue was undeniable, especially at the "unhunted" part. "Will the price reflect the accommodations?" I asked. "Sure it will," Enrique said with a laugh. "We'll have to rough it and hunt hard, but I flew there last week, and I scouted it myself. There's good water, browse, fresh deer sign everywhere, and I saw two groups of deer that included bucks. That place is holding deer now. Plus there are two knolls on one side of the ranch and a good-sized ridge on the other edge of the property that will allow us to use the 'Big Eyes.' This place is perfect for a guy who can do without the hacienda and margaritas." I gritted my teeth and asked, "How much, Ramírez?" "Don't worry," he laughed. "By the time the hunt comes around, you'll be on board. This hunt is perfect for you. The ranch is great. And this is the year to hunt Sonora. (Enrique seems to think that every year is the year to hunt Sonora). "Don't worry, compadre." Sonora is big-buck hunting in more ways than one. In my early research, I ran across numerous full-blown hacienda mule-deer hunts priced near $10,000, an astronomical amount for most working-class hunters, especially for a big-game species that is plentiful throughout much of the American West. Every year, hunters in the Sonora desert take very desirable trophy mule deer like this one taken by Johnny Grimes, Midland, Texas. Such hunts offer luxury accommodations and the kind of four-star services that many well-to-do clients prefer. They also target mule deer the likes of which are found in precious few other places on earth. Still, the same type of pampering is part and parcel of a South African safari, and a plains-game hunt with such a budget can be fully expected to yield a good number of quality trophies. Hunting mule deer in Sonora is not cheap, no matter how you slice it, and, in contrast to a safari, any fair-chase hunt for trophy mule deer is by definition a relatively low-odds proposition. Still, while not inexpensive, this hunt was different. Enrique believes that many hunters will find a way to stretch their budget should they have a chance to make a previously unattainable hunt of a lifetime at a good price. He regularly scours the landscape in Hermosillo and the surrounding areas looking for ranches that for whatever reason do not lend themselves to large-scale outfitters who typically prefer to coordinate as many hunters as possible during a limited hunting season. These ranches can be gems, especially if they have gone unhunted for a few years! In our case, Enrique found a relatively small ranch, (2,400 hectares), with only two tags allotted to it. The ranch house itself was a good and spacious structure, better than most actually, but the trickle of nonpotable water at the end of its two pipes was always cold, there was no electricity, and the plumbing in the loo was unsatisfactory, to put it mildly. The rooms were large enough, with bunks and beds a-plenty, but mattresses were well past their prime. I found the makeshift cots made out of two-by-fours and tightly stretched burlap much more to my liking. A pervasive odor of kerosene caused a constant mild headache, but when I learned that mopping the tiled floor with fuel kept out scorpions, tarantulas, and snakes, the ache behind my eye quickly became less objectionable. Needless to say, there were no mango margaritas at lunch. This type of "roughing it" ends the discussion for many hunters. And that is just fine with me. A look beyond these inconveniences yielded a ranch that had not been hunted in several consecutive seasons. To me, that meant that it was a likely sanctuary for older-class bucks. Moreover, the layout of the ranch was particularly well suited for glassing, with high points on the edges of the property and a large flat area within it. 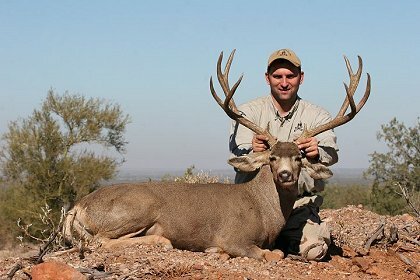 I knew Enrique had cut his teeth on tripod-mounted fifteen-power "Big Eyes" in the Coues-deer mountains of southern Arizona and northern Sonora, and I was certain that he and his guides had the skills and equipment that we needed to capitalize on this ranch's topography to find big bucks. The kicker was when Enrique traveled to the ranch in early July to look it over himself before he offered his recommendation on that year's prospects for a post-Christmas hunt. 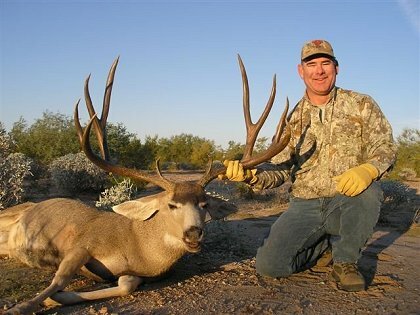 I had already hunted muleys and Coues deer in Arizona with him, so I knew first-hand how well he knows deer. On his thumbs up, I was sold. It turned out that he was right. By hunt time, I had sold a safe queen, forgone a lift kit on the four-wheel-drive, worked some overtime, and eaten enough canned-tuna lunches to horde enough hunt money to make the trip — one that I had dreamed of but never thought that I would make. After an eventful but apparently routine border crossing, we spent the four-hour car ride to Hermosillo in deep discussions of strategy and expectations, and the general palaver that is typical of a bunch of guys crammed into a Japanese SUV on their way to hunt giant mule deer. We assembled for a final pow-wow later that night after we met in Hermosillo with our Mexican outfitters, who told us that several bucks with spreads approaching and exceeding the magical thirty inches had been seen on the ranch in the last few days. Enrique wanted clear expectations out in the open for the benefit of all hunters and guides. "What kind of buck are you looking for?" he asked. I did not have a difficult time articulating my desire, especially after I had heard the information from our locals. For the first part of the hunt, I was after my dream deer — a typical four-by-four with a thirty-inch spread. I had not come to Sonora to shoot a "representative" mule deer. I would alter my expectations as the hunt progressed if conditions warranted, but for the time being, I was hunting the Holy Grail of mule deer! We divided into two groups in the blue-gray of first dawn, after a quick coffee over the smoky fogata at the ranch house. My hunting partner on the trip was Ken Driggs, a mining company executive and as good of company as you could desire on any hunt. Ken drew the high hill on the east side of the ranch. He and his guide, Steve Mullineaux of Tucson, Arizona, would immediately gain elevation and use Steve's Big Eyes to scour the landscape to the west. Alfredo, my assigned guide, Antonio, a ranch hand, Enrique, and I jumped in the 4-Runner at first light and drove slowly along the ranch's dirt roads toward a smallish knob on the west end of the ranch. We would be facing the rising sun once we were on the knob, but the few hundred feet of elevation would give us a good view of the terrain below. Jackrabbits the size of small dogs exploded from the underbrush and bounded into the surprisingly verdant desert growth. A group of javelina appeared and just as quickly vanished into the landscape to the left of the truck. A mule-deer doe bolted from between two ironwoods in the farthest depths of the desert that we could see from the 4-Runner's cab. Alfredo maneuvered the truck to park it on the west side of a tallish, spiny palo verde, and motioned with his hand toward the thorns above, a warning of the sharp spikes to be avoided as we got out of the vehicle. An index finger over lips was a reminder to us all to shut the doors quietly and to speak only in brief whispers. The cool desert stillness enveloped us as we trudged through the rocky sand up the back side of the knob, carefully ducking the ever-present palo verde branches, with their inch-long thorns, and maneuvered around the prickly ocotillo and saguaro cacti that continuously threatened us in the early light. After we had climbed for a bit, we side-hilled around the knob, came around a large stand of ocotillo surrounding a giant saguaro like a thorny battlement, and came upon a natural shelf on the knob. The desert floor opened up below our perch, so we could see across the entire ranch to the higher ridgeline to the east that was the opposite ranch boundary. Alfredo, in the lead as he came into our glassing spot, crouched and motioned us down with his hands, palm down. Enrique placed himself behind the partial cover of some desert brush and began extending the legs of his tripod, and I had just begun to unsnap my backpack, when Alfredo, who was already glassing, indicated with an almost imperceptible motion with his hand held below his waist that he had spotted deer. This giant buck, about thirty-five or more inches wide, eluded us for five days, although we saw him several times. The guides thought that he was ugly! He turned to me, soundlessly mouthed "buu-rro", and placed his index finger over his lips, then slowly pointed. And there, half an hour into my first Sonoran mule-deer hunt, in plain sight in the brush and cacti two hundred yards below us, stood the biggest buck, by far, of my entire mule-deer hunting career. "Tiene velas muy grandes," Alfredo said, in a business-as-usual tone. "He has very long tines." Even in the early light of the desert dawn, the sheer mass of the buck's rack was stunning. He was enormous! As he browsed on palo verde, broadside to us, his massive, dark-mahogany rack dipped and swayed ponderously on either side with each heavy step, and his body weight shifted with the load on his head. He was simply magnificent — a monster of a mule deer. I knew immediately I was in another league. Good morning, and welcome to Sonora! I followed the gi-normous buck with my binoculars as he drifted through the desert brush, trying to get an idea of his spread, then, realizing how foolish that notion was, I looked to Alfredo for what I assumed would be some indication to shoot this monster. Instead, Alfredo was now glassing another area. "¡Otro más!" he hissed as he motioned for me to get down. "Another one!" "Where?" I asked incredulously. "¿Dónde?" I spent the next few minutes anxiously alternating between glassing "our" three-by-three, occasionally confirming that the giant was still there with a glimpse of hide or of flickering tail through the brush, and watching Alfredo contort and maneuver trying to get a good angle to see the second buck. Finally, he lowered his binoculars and hunched down to talk to me. "That other buck is "muy ancho," he said. "Very wide. He will easily go past thirty inches. But he has one side with very shallow forks. He is a "muy grande," but he is ugly." "Is he bigger than this three-by-three?" I asked. "Oh sí." "Oh yes. That one is "un burro muy grande." This pronouncement left me dumbfounded. All of my previous mule-deer hunting experience, gathered over many years and in various places across the United States, seemed irrelevant here. How was I to choose between an absolute monster I could see and a decidedly bigger (and "uglier") monster that I could not see? Alfredo read the angst on my face and put his hand on my shoulder reassuringly. "Cálmate." "Calm down. They're not going anywhere," he smiled. "This is a good ranch." He lifted his binoculars and resumed glassing. I sat in the dirt, bewildered, and tried my best to glass new country, but my binoculars kept roaming between the three-by-three and the general area where Alfredo had seen the big buck. And as I contemplated the situation and my next move, a scene unfolded that I will never forget. The movement caught all of our eyes, but Enrique, behind the fifteen-power binoculars and tripod, could not contain himself. From the east side of the ranch, trotting with a purpose across the desert floor in our direction, came a very large, wide-racked buck. "That's a different buck," Alfredo said, raising his binoculars to confirm. "No se muevan." "Don't anybody move." 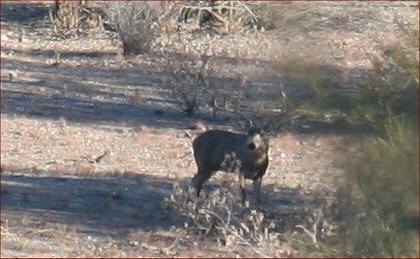 The buck continued on the same course, trot-weaving his way through the palo verde and saguaro, back and forth, over and about, easily maneuvering around anything in his path. He reached a four-strand barbed-wire fence that crossed the ranch, paused, raised his nose into the air as if to stretch his neck, and shook his head like a dog shaking water out of his ears. A confusing tangle of wide, thick, dark-horned tines glinted maddeningly in the sun. The sight obliterated any semblance of composure that I might have still had. He was absolutely beautiful! Unabashedly out in the now-open sunlight, the buck collected himself and jumped the four-strand fence effortlessly. The outsized basket on his head was plainly visible from hundreds of yards away as he continued weaving and trotting through the desert landscape toward us. Alfredo waited for the buck to disappear momentarily behind an ironwood tree, then motioned for me to a begin moving downhill toward a spot in the cover of a large mesquite. "We can shoot from down here." We moved carefully down the slope, and suddenly the big three-by-three appeared on the desert floor, still broadside to us but no longer feeding, instead staring intently at the direction from which the other buck approached. "The other one is coming for this three-by-three," I hissed. "Sí Alfredo agreed. "Párate aquí" "Stand here, and let's wait for him to come in. You might get your choice of bucks," he smiled. If I never hunt mule deer again (fat chance! ), I can say with certainty that in those moments, I experienced all the excitement and anticipation any mule-deer hunter could ever ask for! The two biggest bucks I had ever seen appeared to be headed for a confrontation two hundred yards from me, and I had a tag in my pack and a .300 Winchester in my hands! It was almost too good to be true. And then, Lady Luck played her tricky hand. The three-by-three gave a little start and maneuvered himself behind a stand of palo verde where Alfredo and I could not see him. The beautiful buck, making a beeline for the three-by-three, was now able to approach his rival shielded from our view, and we dared not move. Minutes passed without a clue as to the location of either buck, and then Alfredo and I heard a quick snuffling and a clack of hooves on rocks in the trees, and I spied a fleeting glimpse of a rump and a dark, tall rack moving away out of the cover. "There they go," I whispered under my breath. "One is still in there," Alfredo corrected. "¡Sí!" "Only one moved away!" "Which one?" I asked. "I think I saw the three-by-three move away." "No se." "I don't know," said Alfredo. "But one is still in there." He put his index finger to his lips. Alfredo's slow-motion stillness left no doubt as to the imminence of our quarry. I scoured the openings in the brush looking for any sign of the buck, and the thought that the buck of my dreams was right in there, as confirmed by my savvy guide's body language, made the minutes seem like hours. We waited and waited and waited, as Alfredo coolly played the game as he had played it so often before, patiently waiting out the buck and letting it make the first mistake, and me, a veteran of dozens of spot-and-stalk mule-deer hunts, feeling like a kid standing over his first bird dog on point, the ultimate moment at hand and no clue how to proceed. A long time later, as Alfredo used his binoculars to glass through the brush, the doubt had conquered me. Surely the buck was gone. Not a sound, not a glimpse — he must have followed the first buck away, and now both bucks were probably long gone. Surely, he could not still be in there. "He's not in there," I whispered. "Alfredo, do you see him?" The pebble that landed near my feet made me jump. Alfredo and I looked back up the hill with a start, and Enrique, who with Antonio had remained on the knob using the Big Eyes, beckoned us up the hill with animated arm motions and a pleading face. In response to our questioning looks, he spread his hands over his head to mimic a big buck's rack, and again beckoned us to hurry up the hill. "I got him!" he said as we approached a short time later, and he looked at me with eyes I will never forget. "He's standing in the shadow of an ironwood four hundred yards out. I already ranged him. He is big!" "Is he in the 15s?" I asked. "Let me see if I can find him though your setup." I approached the Big Eyes delicately, careful not to bump the tripod, looked through, and immediately saw the buck. My first impression was that he was not the three-by-three, and while very big, that his rack did not have the sheer mass nor the tine length of the three-by-three. "Not yet," he said without lowering his binoculars. "Follow the fence line to the biggest ironwood about 500 yards out." "Now move left to the big stand of brush with a deep patch of shadow on this side of it. He's in the middle of that shadow patch, against the brush line, looking right at us!" "I see him now; that's the buck that came across," Alfredo said, and he immediately began scanning the rest of the desert floor for the other deer. "He must have sneaked out of there when the three-by-three took off." After a moment, he went back to the buck with his binoculars. "Can you kill him from here?" "Four hundred yards is a long shot," I answered a moment later. "Can we get closer?" "He's already seen us. If we go down to the desert floor now, all bets are off. We might get a shot at him, but he'll know we're coming, so the odds are against us. Right here, you have a clean, open shot, and he's broadside." "He's a solid four-by-four, with good eye guards, and I estimate he will go between twenty-eight and thirty inches. He's not a super grande, but that's a genuine trophy mule deer, and I don't think you should pass up this opportunity." "It's the first morning of the hunt. You want me to shoot already? Is that three-by-three bigger?" "The three-by-three is not standing there giving you an open shot, amigo." "Is he going to go thirty?" I asked again. In that moment, I looked back, and Antonio the ranch hand, who had been quietly sitting and glassing by himself, looked at me and winked, nodding reassuringly that the buck would go thirty inches. I looked at Enrique, and he minced no words, "Rick, please shoot this buck!" Then, after a moment, Alfredo came again. "Can you make this shot?" He pulled his eyes away from his binoculars, and looked at me. It is said that once you lose buck fever, you should stop hunting deer. I can tell you that if ever there was any doubt as to whether I am susceptible to buck fever, it was dispelled that morning. It was all I could do at first to keep the reticle on hair as I set up behind the shooting sticks. I adjusted my stance, leaned this way and that, grabbed the crux of sticks and rifle in my left hand, only to have to reach back and crank up the scope to 8x, and grab again. I shifted and shafted, shimmied and shook, and finally, I was ready, pretty steady on the sticks, comfortable, with the buck still standing broadside in the shade. I settled in, breathed deeply, allowed the crosshairs to settle — and then I made a big mistake. Buck fever had set in, and I was so concentrated on keeping the crosshairs still that I miscalculated my holdover and held on the back line (a correct three-hundred-yard hold) right in line with the front leg, instead of twelve-inches higher. I took my time and got the shot off. Everything felt good — the sight picture, the hold, the breathing, the trigger let-off. Bingo! "You got him!" Enrique said. "It felt good," I replied as I got set up for a second shot and looked for a downed buck in the scope. "He's still standing," Alfredo said, and my heart hit my ankles. "You hit him, but not too good. You need to shoot again, amigo." "En la pata," Antonio said from behind me. "You hit him in the leg." "Yes," Enrique said from behind the Big Eyes. "Now I see. You broke his front leg. You hit him too low!" Four hundred yards! Oh my gosh! I collected myself, set up again, corrected my aim, and squeezed the trigger slowly. This time, I heard the whump! of the bullet as the hit echoed back to us. "¡Buen tiro!" Antonio said from behind his binoculars. "Good shot!" "He's down now!" Enrique yelled. "Yes!" Alfredo held up his binoculars a few moments more, then said "¡Ahora sí!" "Now you got him!" He clapped me on the back, looked me in the eye with the grin of the devil, and said, "Vas a estar muy contento." "You are going to be very happy." All I could think was that I almost blew it. I have approached dozens of dead mule deer in the field. I need no convincing that ground shrinkage is an irrefutable truth. I have come to expect it. You’d grin too if you’d just shot a thirty-one-inch typical buck like this one that I got the first morning of the hunt. I believe I lacked the emotional capacity at the time to absorb the meaning of Alfredo's last words to me as we made our way hurriedly down the knob and through the desert growth toward the buck. I was still recovering from my blunder. "Aquí está." "Here he is." Relief flooded my adrenal system. "No confíes," Alfredo warned. "Don't presume (that he's dead)." "Está bien muerto," Antonio replied. "He's good and dead!" I rounded the stand of cover toward Antonio's desert-muffled voice, and I simply could not believe what lay before me. The buck's rack was very dark, a red-tinged chocolate, and protruded above the brush like a solitary chair on an empty dance floor. I was awestruck! "No ground shrinkage today," I said nervously, more to myself than anybody else. The sheer size of the animal had erased all thought of spread and score from my mind. This was by far the biggest deer I had ever seen on the ground, an absolute beauty, and my Sonora deer hunt was an unquestionable success, at nine in the morning on Day One. Alfredo looked at me and said with a smile, "He's going to go thirty-one, amigo. That's the buck you wanted last night. There you go. Welcome to Sonora!" I looked at him and realized he had known it all along. My first trip to Sonora was extremely special and in many ways unusual. Fortune undoubtedly smiled on me! We saw extremely big bucks throughout the trip, some more than once. However, my hunting partner (who already has thirty-inch-plus deer on his wall and was looking for a true Sonora superbuck) passed up thirty-inch deer early in the hunt and went home empty handed. That's hunting, and that's Sonora. In retrospect, Alfredo, my guide, was right. An open shot at a standing buck in the desert is nothing to take for granted, and fleeting shots through brush on the desert floor are much more common. The stakes are high because, as in Africa, one drop of blood means your tag is filled, whether you recover the buck or not! Now I understand why he urged me to take the long but otherwise good shot. On one occasion, my hunting partner had a patch of hide to shoot at through the brush. That, and the word of his guide that it was a shooter buck, was all the information he had. He passed up the shot, much to his guide's (and later his own) angst, but sometimes, that's all you get in the desert. Hunting in Sonora is not cheap, and despite the relative abundance of big and also truly giant mule deer, it is no sure thing. It's hunting, and damn good hunting at that. I'm going back! If you are interested in coming along on a Sonora mule deer hunt, please contact [email protected] for details. Copyright 2000-2017 24hourcampfire.com, Inc. All Rights Reserved.